Analysis: What are the chances of a London Grand Prix? 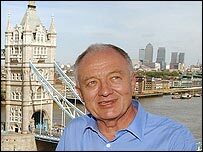 London mayor Ken Livingstone has told the BBC that the capital could host a Formula One Grand Prix by 2007. Mr Livingstone said at Tuesday's F1 demonstration in Regent Street that he backed the idea and shrugged off claims it would cause too much disruption. "We started talking to (F1 boss) Bernie Ecclestone and his people about a year ago about putting on a proper F1 race. "It would probably bring two million people to London and we're really up for it," Livingstone said. 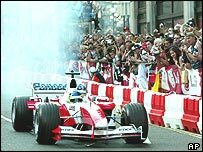 About 500,000 people saw eight F1 cars drive on a course laid out between Regent Street and Piccadilly Circus. The event had to be cut short because of the large numbers of people attending. But Livingstone said the capital could easily handle the organisation required for a race. "Bear in mind that 85% of the people who come into central London come by public transport," he told BBC Radio Five Live. "These things can easily be managed as long as you plan properly, and nobody ever questioned Bernie Ecclestone's planning abilities." Livingstone said he had already pencilled in a possible route for the track, which would "centre on Hyde Park Corner and Park Lane". "Something like this takes a minimum of 18 months' planning, so you're most probably taking two years away." Silverstone has a contract to host the British Grand Prix until 2006, but there has been speculation that any London race could be held in addition to the country's existing event. The idea won the approval of all the drivers taking part in the demonstration, with Nigel Mansell, Jenson Button and Juan Pablo Montoya all saying it would work. Williams driver Montoya said: "It would be awesome. "I've raced in a lot of street circuits in America and they test the teams and drivers more. To bring Formula One to people would be a really good thing." Mansell added: "They have the infrastructure here, they have the organisation. It could be absolutely sensational. "Look how quickly it's been put together. I reckon a circuit could be ready within one year." Event organiser Harvey Goldsmith has said there would be a number of bureaucratic obstacles to overcome before a London GP could get off the ground. "It would be a good chance for people to appreciate what Formula One is all about," said Montoya. "People would get a better image of what Formula One is. A lot of people love it and a lot of people hate it, but on TV you do not see how extreme the cars are. "It does not look that fast. "But when you go and see it up close, it's like 'phew!'. It's a different story." Eight teams sent cars to the demonstration, with Mansell, who retired in 1992, driving a Jordan and fellow ex-driver Martin Brundle in a Jaguar. Montoya, McLaren's David Coulthard, Button of BAR-Honda, Ferrari test driver Luca Badoer, Toyota's Cristiano da Matta and Minardi's Zsolt Baumgartner all drove their regular cars. Report: Could London stage a Grand Prix?